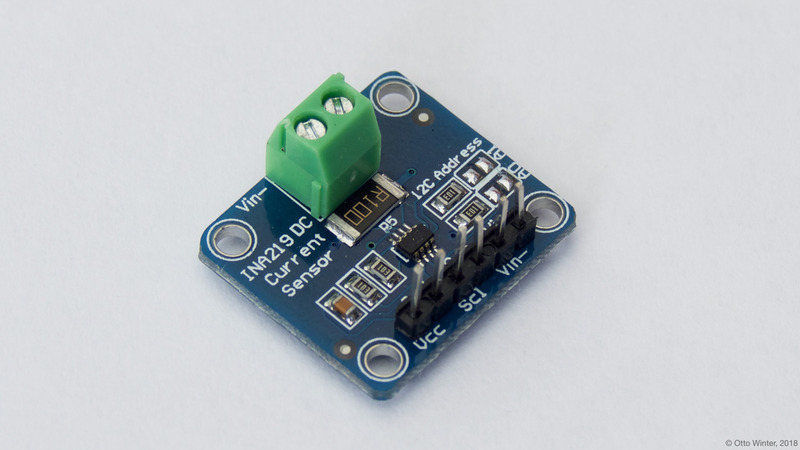 The ina219 sensor platform allows you to use your INA219 High Side DC Current Sensor (datasheet, Adafruit) sensors with ESPHome. The I²C Bus is required to be set up in your configuration for this sensor to work. address (Optional, int): Manually specify the i^2c address of the sensor. Defaults to 0x40. shunt_resistance (Optional, float): The value of the shunt resistor on the board for current calculation. Defaults to 0.1 ohm. max_voltage (Optional, float): The maximum bus voltage you are expecting. ESPHome will use this to configure the sensor optimally. Defaults to 32V (the max). max_current (Optional, float): The maximum current you are expecting. ESPHome will use this to configure the sensor optimally. Defaults to 3.2A. current (Optional): Use the current value of the sensor in amperes. All options from Sensor. power (Optional): Use the power value of the sensor in watts. All options from Sensor. bus_voltage (Optional): Use the bus voltage (voltage of the high side contact) value of the sensor in V. All options from Sensor. shunt_voltage (Optional): Use the shunt voltage (voltage across the shunt resistor) value of the sensor in V. All options from Sensor.